Holroyd Quartet 2nd Place Winners. Richard Sandham, Andy Yule, Bella Harvey & Raph Harvey. 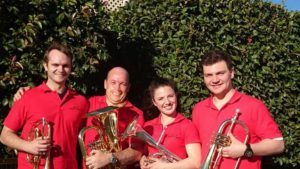 At the recent State Solo and Party Contest, Holroyd Brass were well represented with some wonderful performances which led to a number of great results. Members of the band came home with many well deserved wins, including five in the Open Solo Events: Andy Yule (Euphonium), Bella Harvey (Tenor Horn), Raph Harvey (Flugal Horn), Richard Sandham (Bb Cornet) and Jess Ling (Bb Tuba). In the quartet competition, the group from Holroyd made up of the solo winners: Andy Yule, Bella Harvey, Raph Harvey and Richard Sandham put in an amazing effort, came in 2nd to a cracking performance by the Castle Hill RSL band. To follow up her win of Champion of Champions at the recent National Competition in Brisbane earlier this year, Bella Harvey once again took out the Champion of Champions competition, competing against her fellow bandsmen in a tough competition. Richard Sandham was also given an Honourable Mention due to his solid performance as well. A big thank you goes to Denise Harvey, mum to Bella and Raph, who was the piano accompanist for band members through the solo and champion of champion events. Denise did a tremendous job and certainly added to the performances. Overall it was a great day for Holroyd, a lot of fun for all who took part and was an excellent opportunity to celebrate the exceptional musical talent within the band.